Patellar tendon tears most commonly occur in middle-aged people who participate in sports which involve jumping and running. The Patellar tendon can be ruptured by several reasons such as by fall, direct blow to the knee, or landing on the foot awkwardly from a jump. Other causes include patellar tendonitis (inflammation of patellar tendon), diseases such as rheumatoid arthritis, diabetes mellitus, infection, and chronic renal failure. Use of medications such as steroids can cause increased muscle and tendon weakness. When the patellar tendon tears, the patella may lose its anchoring support to the tibia. 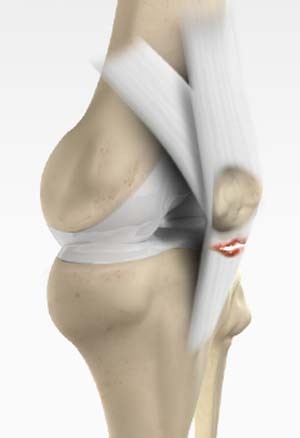 As a result, when the quadriceps muscle contracts, the patella may move up into the thigh. You are unable to straighten your knee, and upon standing the knee buckles upon itself. In addition to this, you may have pain, swelling, tenderness, a tearing or popping sensation, bruising, and cramping. Patellar tendon tears can be a partial or a complete tear. Non-surgical treatment involves the use of braces or splints to immobilize the knee. Physical therapy may be recommended to restore the strength and increase range of motion of the knee. Surgery is performed on an outpatient basis and not arthroscopically since the tendon is present outside the joint. The goal of the surgery is to reattach the torn tendon to knee cap and to restore the normal function in the affected leg. The procedure is performed under regional or general anesthesia, and an incision is made on the front of the knee to expose the tendon rupture. Holes are made in the patella, and strong sutures are tied to the tendon and then threaded through these holes. These sutures are tied in place to pull the torn edge of the tendon back to its normal position on the kneecap. Complications after the repair include weakness and loss of motion. In some cases, the tendon which re-attached may detach from the knee cap, or re-tears may also occur. Other complications such as infection and blood clot may be observed.